NORTH BAY, Ont. 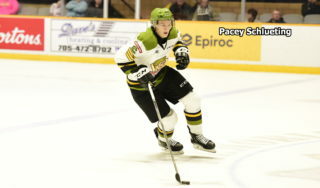 – Mathew Santos scored three goals to power the North Bay Battalion to a 7-2 Ontario Hockey League victory Friday night over the Peterborough Petes. Zach Poirier netted two goals, Brenden Miller had one goal and two assists and Kyle Wood also scored for the Battalion, which erupted for five unanswered third-period goals to win a second straight game since a 2-1 loss at Peterborough on Nov. 6. Goaltender Jake Smith faced 29 shots before a crowd of 3,514. North Bay improved its won-lost-extended record to 10-3-4 for 24 points atop the Central Division, six points ahead of the second-place Barrie Colts with a game in hand. The Battalion visits Barrie at 7:30 p.m. Saturday. Anthony Stefano and Michael Clarke scored for Peterborough, which has suffered three consecutive losses since beating the Troops. Goaltender Matthew Mancina made 39 saves for the Petes, 5-9-3 for 13 points, fifth and last in the East Division. The Petes, who trailed 2-0 through 40 minutes, tied the game with two goals 1:22 apart, starting with Stefano’s conversion of a Josh Maguire pass from behind the net at 4:41 of the third period. Clarke then snapped home a Steven Lorentz feed from deep in the right-wing circle. Defenceman Miller, on a solo sortie into the offensive zone off a turnover, scored the winner at 9:41. Miller, playing his 200th OHL game, hammered the puck between Mancina’s pads from inside the blue line for a seventh goal on the season. Fifteen seconds after Santos went off for high-sticking at 14:16, the Petes’ Hunter Garlent and Dominik Masin drew simultaneous tripping penalties, and the Battalion capitalized on both. With the Troops skating four-on-three, Wood connected at 15:19, sparking a spate of four goals in a span of 4:16. Defenceman Wood moved into the deep slot and buried a Nick Paul pass. 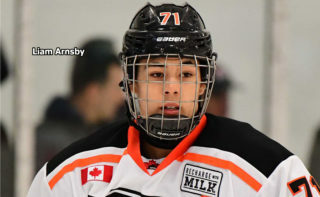 Santos scored at 16:27 to finish off a three-on-one rush with the man advantage, and Poirier darted into the goalmouth to flip a backhander into the top corner at 18:23. The goal was the third for Poirier, who last saw action in a 4-3 victory Oct. 19 over the visiting Mississauga Steelheads. 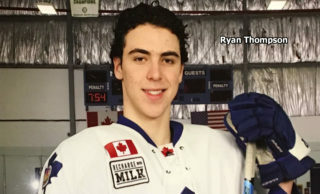 He missed a total of eight games with an injury and while with Canada Black at the World Under-17 Hockey Challenge. 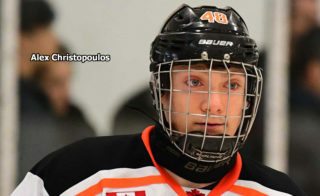 Santos capped the scoring on the power play at 19:35, beating Mancina high to the stick side for a fifth goal. Poirier broke a scoreless tie at 10:21 of the second period, corralling a loose puck and spinning to beat a screened Mancina low to the stick side. David Sherman earned the only assist. Alex Henriksson set up North Bay’s second goal, on the power play at 19:15, seconds after leaving the penalty box. 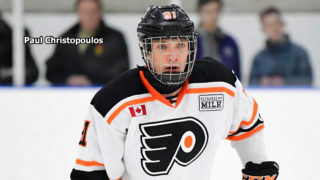 He carried the puck into Petes territory and fed Santos, who evaded Connor Boland, cruised across the goalmouth and waited for Mancina to commit before firing the puck home. The Battalion outshot the Petes 13-12 in the scoreless first frame. Mancina stopped Paul’s shot from the top of the left circle in the fourth minute, blocked a Brett McKenzie effort and two by Zach Bratina in the 15th minute and got the right shoulder on a Mike Baird shot in the 18th. The game at Barrie can be seen live in North Bay on TVCogeco Cable 12 and heard on Country 600 CKAT. BATTALION BULLETS: The Battalion, which wore green-based camouflage-style sweaters and socks, conducted a Remembrance Day salute. Dignitaries included Colonel Sean Boyle, commander of 22 Wing, Canadian Forces North Bay, and Major Kevin Carson, commanding officer of 33 Service Battalion North Bay. The national anthem was sung by retired sergeant Lionel Murphy, 89, who served in the Royal Canadian Navy in the Second World War and the Canadian Army in Korea … Butler evened his OHL coaching record at 586 wins, 586 losses and 65 ties in 1,237 games with the Oshawa Generals and Battalion, in both Brampton and North Bay … Miller has 38 career power-play assists, tied with Kyle Sonnenburg for 10th place on the franchise list … The Troops went 4-for-6 on the power play. 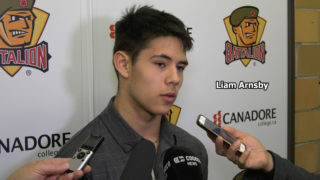 Peterborough was 0-for-2 … Paul, who earned two assists, rejoined the Troops after playing for Team OHL in a 4-0 loss to Russia on Thursday night at Peterborough in the Subway Super Series … Ray Huether also had two assists for North Bay … The Battalion scratched Riley Bruce, Owen Green, Mark Shoemaker and Calvin Gomes … A postponed Battalion visit to the Ottawa 67’s last Sunday has been rescheduled for 7 p.m. Tuesday, Jan. 6. The original schedule fell victim to an ice-system failure at TD Place. The online game sheet can be found here. The game highlights can be found here.